Let’s be honest. You didn’t read those lyrics … you sang them! Now that I got it stuck in your head, let’s do a little questionnaire. How does this song make you feel? Are you energized? Pumped up? Ready to take on a challenge? If so, you’re not alone. “Eye of the Tiger” by Survivor is a common song to hear bursting through the loud speakers on race day morning to get athletes pumped up for the competition that is about to unfold. Question is: Can this tune really get you ready for your race on a psychological, and even physiological, level? Science answers: YES! Music is being recognized more as a handy tool in pre-performance, during performance, and post-performance bouts of exercise. With the right combination of tempo, lyrical content, intensity (loudness) and musical style preference, you can find the perfect tune to get you ready for competition, train with optimum standards and even enhance your recovery. Below are lists of findings researchers discovered with their studies of music and performance along with suggestions on how you can select the best tune for you and your goals. Stimulative music increases motivation, arousal, and influences a positive self-talk and flow state (“in the zone” state). Listening to faster tracks, or tracks with a fast tempo, as well as tracks at a higher volume can increase pleasant and aroused emotional states. Stimulative music influences the “fight or flight” response for the sympathetic system which includes a slight elevation of heart rate. Listening to music, especially motivational-rated music, can improve ratings of perceived exertion (RPE), motivation, and arousal. Effects by music may fade with any efforts over 75% percent of VO2 max since the effort becomes too high. Music can prolong exercise building up to higher intensities toward failure. There is a linear relationship between increasing efforts and music tempo, involving increasing heart rates. However, preferences of music tempi are held within a range. Individuals may improve kinetic patterns since there is a strong response to rhythmical qualities of music. This can lead to an improved technique and coordination especially for repetitive activities. With improvements in the kinetic chain, there are less metabolic demands during activities. Overall time till recovery decreased with a musical stimulus. 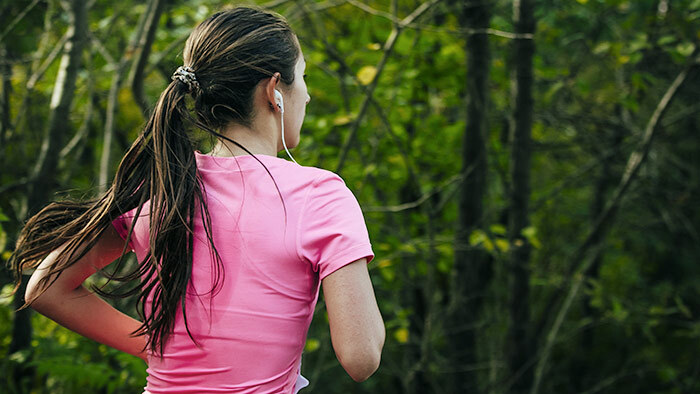 Slower music tracks influenced a slower heart rate and lowered blood pressure after exercise. Sedative music effects RPE during active and static recovery. Before or during moderate to high intensity exercises, choose music with a higher tempo and higher intensity (please keep within safe intensity measures to avoid hearing loss or ear injury). Choose sound tracks that include inspirational and positive lyrics. After exercise, choose sedative, slow musical tracks. Select tracks that have clear, repetitive, rhythmical beats—particularly for during exercise. * Everybody is different! These suggestions may differ per person based on needs and preferences.